It’s been a while…Now that fall is upon us I’m excited for another golden opportunity photographing the Aspens blanketing the high country here in Santa Fe. Starting my career in the visual arts as a painter, I relied on simple photo references taken with an inexpensive instamatic camera … remember those?? When sophisticated digital Cameras and innovative software entered the scene, I realized it was time to put away the paints and brushes; fearlessly, I challenged myself in unfamiliar territory with hope of finding new methods for creative expression. My strong determination and resolve resulted in gratification much beyond anything I could ever have imagined! For the last several years my Workshops, Tours and Webinars have demanded my full attention. Feeling the need for a hiatus to allow time for my own creative projects, my upcoming November 2015 workshop will be my final Santa Fe workshop. The future includes a book, new website/blog and online tutoring. These latest projects will enable me to share my artistic work flow and help you stay inspired and impassioned in reaching your artistic goals. 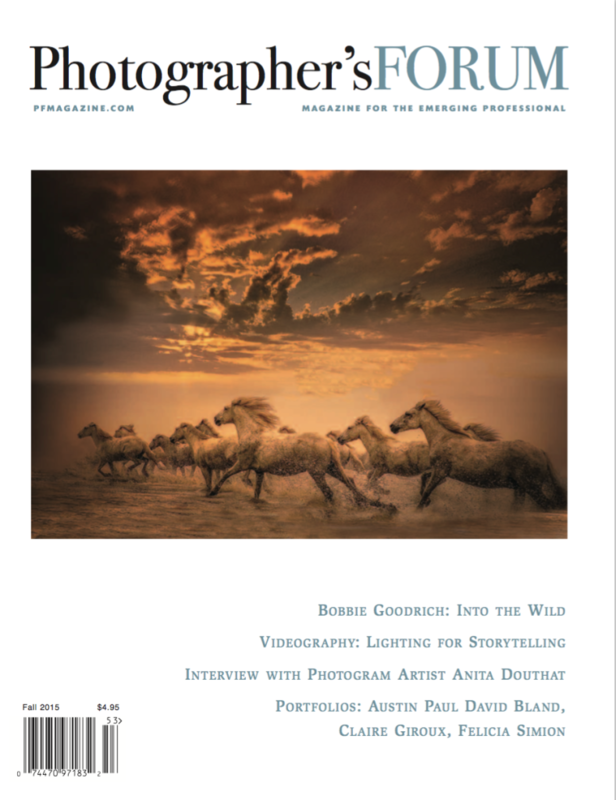 I hope you all get a chance to read my interview appearing in the Fall 2015 issue of PHOTOGRAPHER’S FORUM magazine including the honoring my Camargue horse image which appears on the front cover! Click to read the article in Photographer’s Forum. If you are not a subscriber you can do so online at www.pfmagazine.com A beautiful publication featuring great interviews of professional photographers, equipment reviews, workshops and portfolio submissions. I also encourage everyone to enter their work in the annual “BEST of PHOTOGRAPHY” competition sponsored by Photographers Forum offering great exposure and prizes for emerging professionals. My inclusion in a new book entitled “THE SOFT TOUCH“. Click here to preorder The Soft Touch. Announcing my OCTOBER 9, 2015 show opening, 901 Gallery, Santa Fe, New Mexico. My November 5-9th 2015 CREATIVE ARTISTRY WORKSHOP II with genius photographer Tony Sweet has only ONE space available. Tony’s in–camera dynamic approach to photography is amazing coupled with introduction to the newest and most innovative software for RAW image conversion. Learning Bobbie’s imaginative style will provide any photographer a higher inspiration and knowledge for expansion of artistic goals. This entry was posted in Blog, Newsletter.